Polly is a PhD student researching into cystic fibrosis. She had been working on a recombinant protein. On Friday, she finished the final purification step, ran a quick measurement by Dynamic Light Scattering (DLS) on the Zetasizer to check purity before storing the sample in the fridge for the weekend. 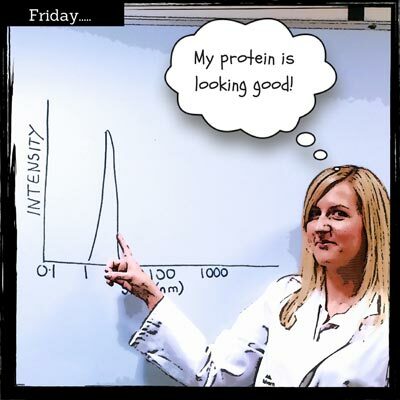 Arriving back in work on Monday, Polly was eager to see how her protein was getting on…. Professor: How’s your newly purified protein after the weekend at 4°C? 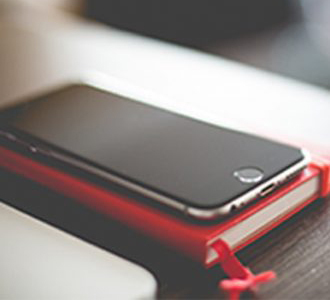 Have you re-run the DLS today – does it look the same as on Friday? Polly: The DLS results look kinda different. 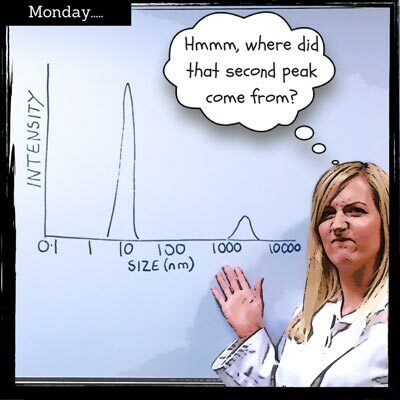 It was like this when I left for the weekend – it had a really nice single peak at around 4 nm in radius which is what we expected from its monomer molecular weight of 90kDa. The main peak has a radius of 5 nm and I’ve got a second in the micron region. The PDI value was roughly 0.06 before and now it is 0.3. Prof: OK, so obviously the protein is not happy in your storage conditions. This DLS profile is typical of what is observed when a protein aggregates. 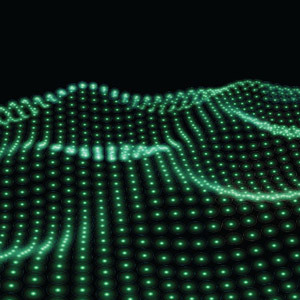 Let’s investigate a bit more…Can you run it in the NanoSight to get a more detailed aggregate profile by Nanoparticle Tracking Analysis (NTA)? It’ll only take a few minutes. Polly: I’ve not tried NTA before, is it different data to DLS? I thought they both were based on measuring Brownian motion? 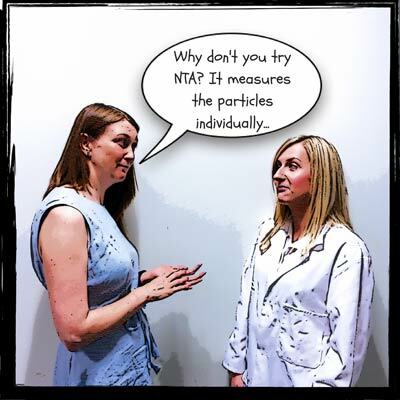 Prof: It’s the same principle of looking at Brownian motion, but the data you get from a DLS measurement is an overall view of the entire sample from 0.3 nm to 5 µm whereas NTA measures the particles individually, typically from a size of 30 nm for a protein, so gives a greater resolution of the different sized aggregate species in your sample. Polly: OK, I’ll give it a try and catch you after lunch…. 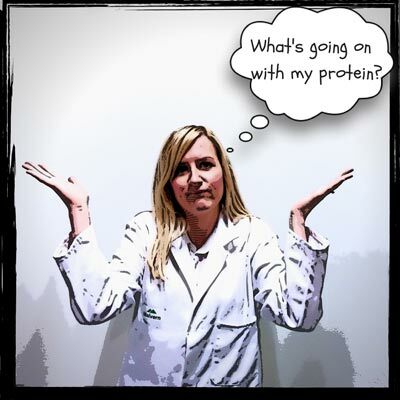 Check back to find out what’s going on with Polly’s protein next week.